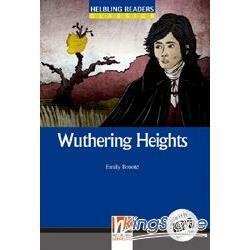 Wuthering Heights is a story about love and revenge. It follows the life of Heathcliff, a mysterious gypsy-like person, from his childhood to his death at the age of 38. It is set on the moors in West Yorkshire, an area Emily Brontë knew and loved. It is the only novel Brontë ever published. The title of the book is the name of one of the two houses that feature in the book, and describes the house's position on a windy (wuthering) hill (height). It tells the story of the unresolved love and passion between childhood friends, Catherine Earnshaw and Heathcliff and how it destroys both them and their families. The book is told in a series of flashbacks by two narrators. The first, Mr Lockwood, rents Thrushcross Grange from Heathcliff and the second, Nelly Dean, is a servant who tells Lockwood about the events of the past. Both of the narrators take part in the action of the story and allow us to have a first-hand account of both the present and past. The main theme in the story is love, and how love can damage people if it is not expressed well. Unresolved love can turn to hate and hate becomes revenge. Nature is another important part of the story and the conflict between nature and civilization is embodied in the relationship between Heathcliff and his rival, Edgar Linton. Although Wuthering Heights is now considered to be a classic of English literature when it was first published critics found the book to be strange and shocking yet they all agreed that it was compulsive reading.